Thursday 25th January black day for Calais. A 16 years old Eritrean teenager very seriously injured, he was shot in the face with a gas grenade : he lost an eye and his nose has gone inside his skull he risks to lose the other eye and has multiple skull fractures: the police arrested his two friends who had gone to the police station to testify, later they were released. The boy was shot during an attack with gas and rubber bullets against refugees who were trying to recuperate their possessions, before the CRS destroy their tents near the place of food distribution in rue Verrotieres. The police destroyed everything under the eyes of refugees and volunteers and lots of gas and rubber bullets were fired to disperse the people. The gas attack and destruction of people’s shelters and belongings involved all the food distribution area, 4migrant people were taken to hospital. The attack can be seen in a video diffused by the Auberge des migrants. People are sleeping out in this cold now, when is -0 the authorities open some shelters but now for instance is very cold and it rains but is not -0 or storm and everybody sleeps out. 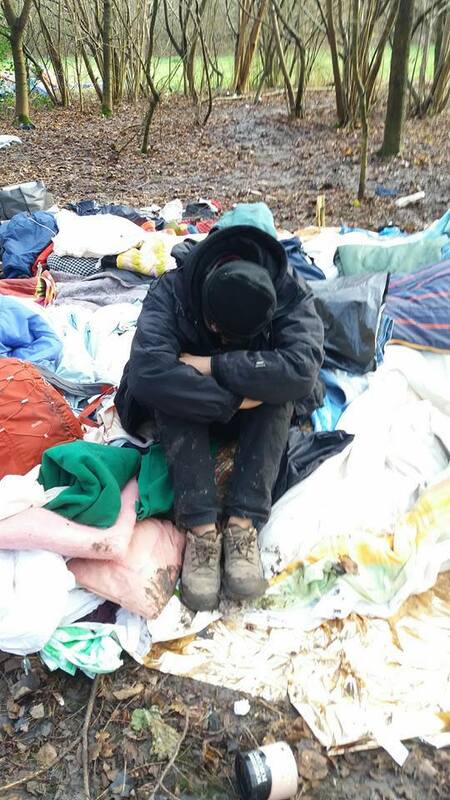 They don’t even have enough blankets because we are just after a big destruction by police. No wonder people are angry, many turn to drinking because they are desperate and who would not drink in such situation, these are people very traumatized. Many new people have arrived after Macron’s visit, some hundreds, dozens of women and many minors, some came because they heard the UK were taking in minors from Calais and where disappointed. There is no place for minors in Calais but two little hostels in St Omer with bad food and not enough bed spaces for all and most kids want to go to UK and come to Calais to try. They sleep in the jungle. A 15 years old from Afghanistan died at the end of 2017, when he was hit by a vehicle. Ways of trying to go UK have became even more dangerous as the border becomes more difficult to cross. But people keep crossing, and it keeps their hope alive. As usual the press are representing the migrants as ‘the problem’ and speaking of ‘rising tensions between migrants and police’ when in fact the police have been causing all the tension, and all the damage. A few people throwing stones at cops in riot gear in retaliation for the shower of gas does not certainly match the flash balls, gas grenades, rubber coated bullets, truncheons, CS spray and real guns. Who gets badly hurt are the refugees, the policemen get lightly injured sometimes. There is no proportion. A man climbed on one of the pylons and threatened to jump, he has mental health problems. People are exasperated and pushed over the edge of survival. The only half good news are that the Dubs scheme is opened again, allowing unaccompanied minors with no family to go leglly to UK, but the details have not been defined and there is not information. The authorites also promised to speed up family reunions, when both France and the UK have been delaying procedures and bringing to a halt the transfers promised – after the destruction of the ‘jungle’ in 2016, the UK promised to take in 3000 kids, took 750 and closed procedures breaking their promise and leaving the others minors stranded. On Monday last, 118 unaccompanied minors were taken by coach from Calais to an improvised accommodation centre in Merlimont, Calais region . The day after more than half of these kids were already leaving on foot towards Calais. During his visit in Calais, 16.01.2018, Macron promised no new camps will be allowed to form ; there are well over 1000 migrant people sleeping out in Calais alone, including many minors, impossible to do even an approximate count in such situation. They do not even have enough access to WATER, people have been spotted drinking from puddles. Associations provide water but only for a few hours each day. 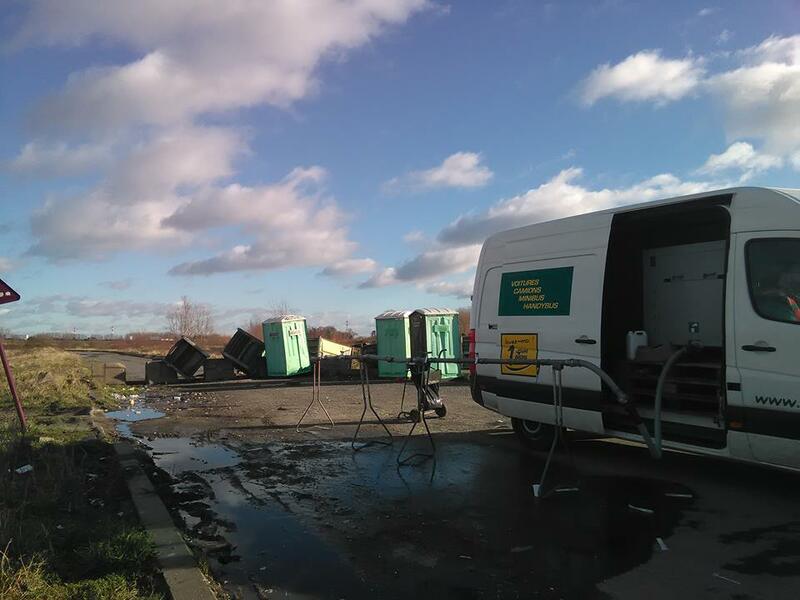 The toilets in the back were knocked down by strong winds. Most people in Calais jungles are from Afghanistan, Eritrea, Ethiopia including many Oromo, Sudan, other African countries , a few Syrians, Egyptians, Kurds, Libyans and Iraqui Arabs. Thousands more people have spread in the region and all around the coast. Near Dunkirk too people camp in the woods, most are Iraqi Kurds including families with young children: their tents are regularly destroyed by police. 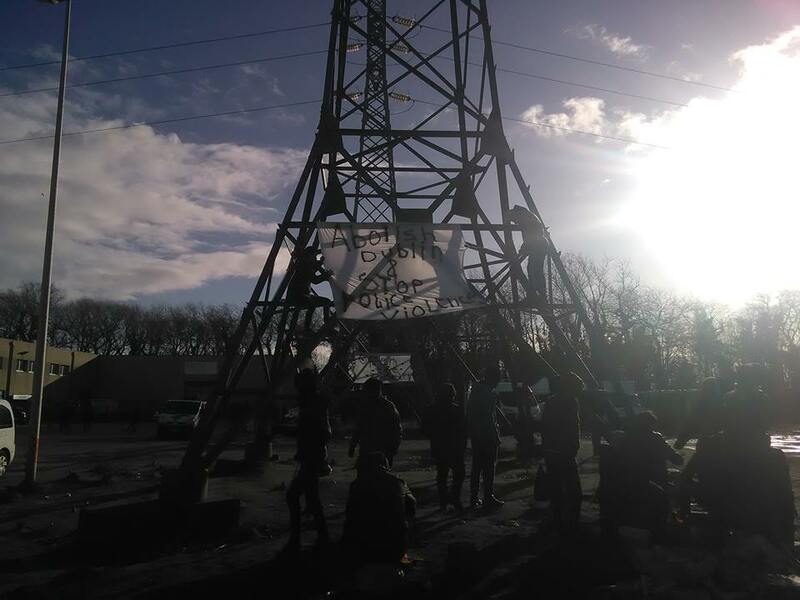 In Ouisterham near Caen a jungle inhabited by 200 Sudanese have been recently destroyed ; local people have mobilized to shelter the people in their homes, and have organized two 1000 strong demonstrations. 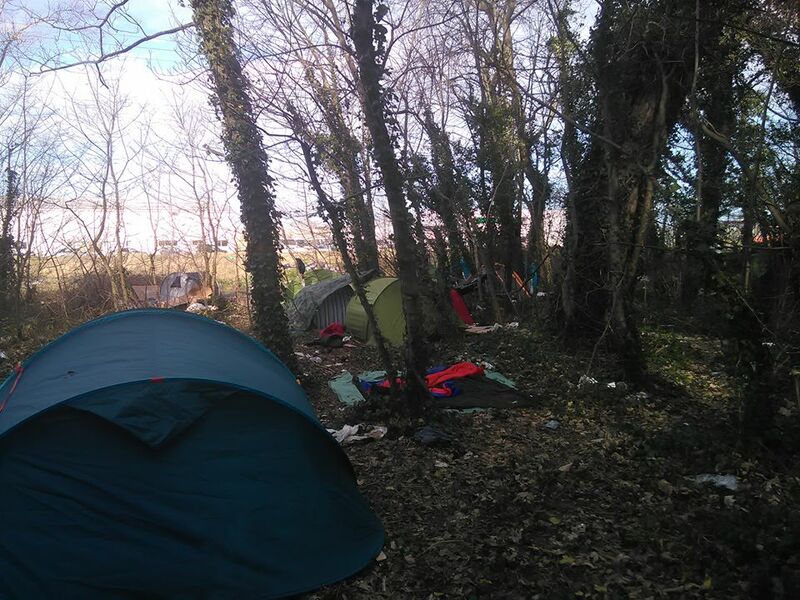 There are people sleeping out in Le Havre and as far as Bilbao in the Basque Country. People are sleeping out with the police chasing them, spraying them with CS gas, beating them and destroying their shelters and belongings . Macron then had a meeting with the associations who help the migrants but three major associations, the Auberge des migrants, Utopia 56 and Medicins du Monde, refused to meet him as they do not want to be seen as accomplishes to more repressive measures. They did however collaborate with, and even approve of the destruction of the ‘jungle’ in 2016: what is happening now is the result of that eviction and was totally predictable. So their current stance on government policies is too little, too late, and probably arrives because the associations themselves are under attack. We really lack a platform who can speak up and defend migrants rights in Calais that is migrant-led, nobody but the people involved have a right to speak about their own situation, and nobody knows it better than them. People living in the jungle are organizing autonomously. 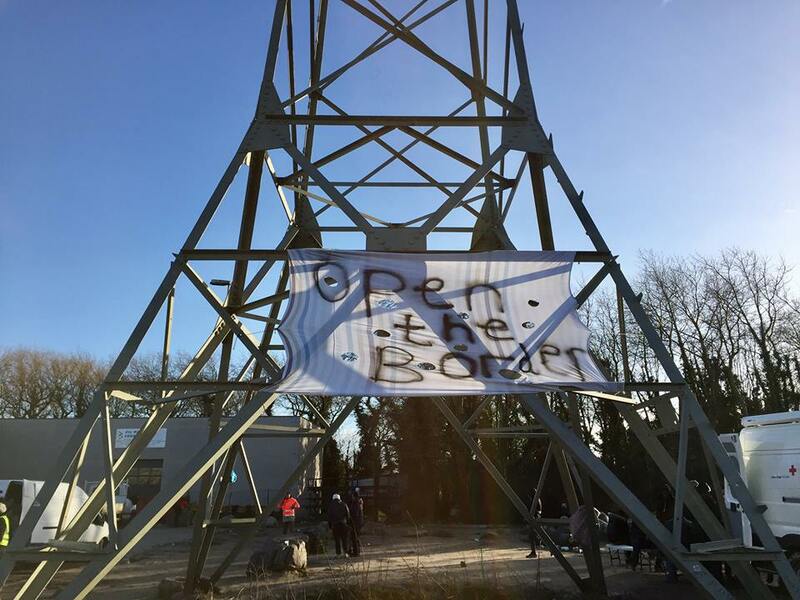 On the occasion of Macron’s visit they hung banners in the jungle reading OPEN THE BORDER, ABOLISH DUBLIN and STOP POLICE VIOLENCE . A group of people who sleep in the jungle wrote a collective statement that was endorsed by many, link below. They have set up a blog called Voice of Refugees, Calais. https://www.facebook.com/noborders1world/posts/552974685094816 Of course Macron did not meet with the refugees and did not go near the jungle. For the authorities, refugees and other migrants are not subjects, they are objects of increasingly repressive policies. It is institutional racism of the worst kind. Things are very bleak indeed, and will become even bleaker. Nevertheless people are not put off, they keep arriving, they brave the terrible living conditions and the constant violence and threat of violence by police, and they keep going to the UK. They keep strong, incredibly cheerful and positive and the community spirit that unites all is still there and is amazing, but there are also frequent fights between different ethnic groups over access to the motorway, and over territory and scarce resources. Many people become ill, Medicins du Monde who now has a mobile clinic and a doctor report they have never seen such a high percent of sick people and blame the appalling living conditions. There is a lot of alcohol and drug abuse also among minors, especially psychiatric drugs that are sold on the black market and mix very badly with alcohol, drunken fights are a problem. Over 90 % of merchandise directed to UK pass through Calais, it is the nearest port city to the UK, and there are many ferries and many lorries, only 1 hour 1/2 journey to the UK by ferry ( 2 hours from Dunkirk and 30 hours from Bilbao). 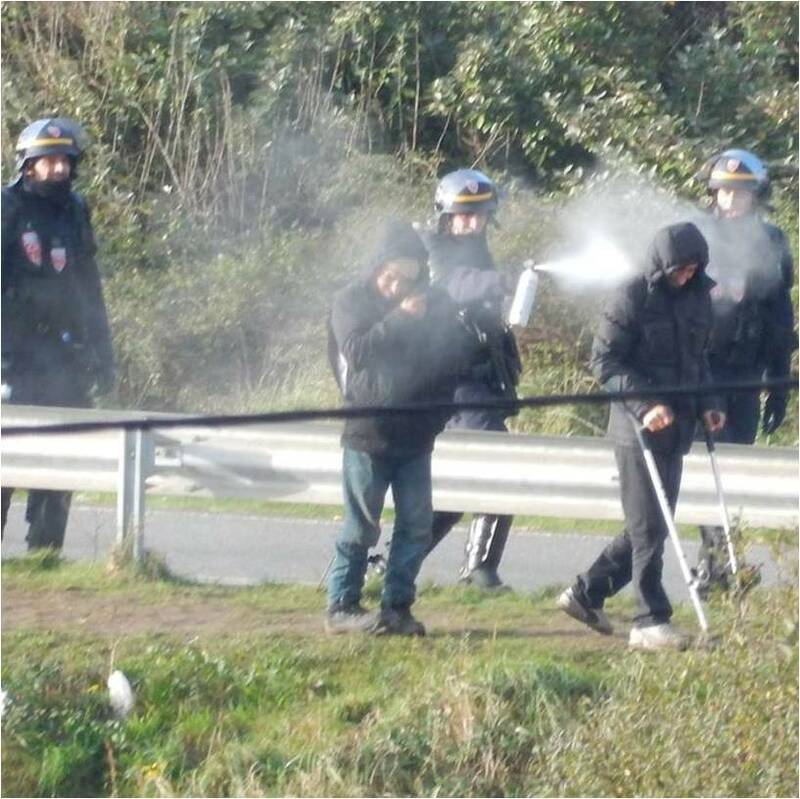 People do not stop coming to Calais. A few days after Macron’s visit hundreds new people arrived, including many minors and quite a few women, and they keep arriving. 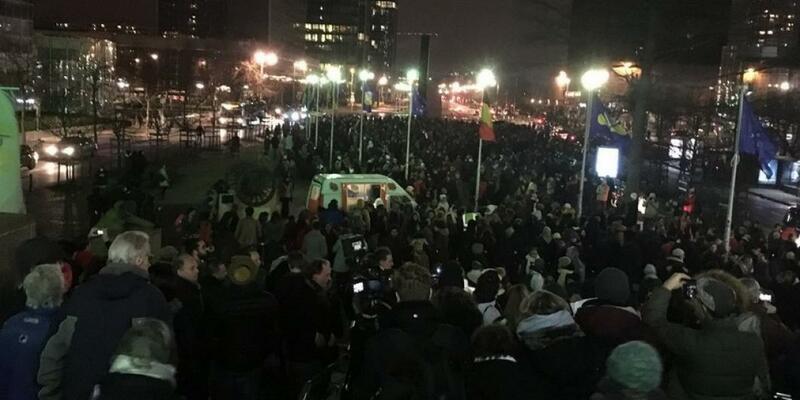 Many come from Belgium to escape the police raids there. There is a new shelter in Calais for women where they are protected but outside it is very dangerous and particularly for women and children, they are more exposed than ever to sexual violence, trafficking and exploitation. Instead there is no shelters for young children (very few) and for unaccompanied minors (very numerous). The jungle is no place for a child : a 14 years boy has lost half a finger for a knife injury sustained during a fight between Africans and Afghans: the doctors had to amputate, and the rest of the hand is badly damaged. There are two shelters for minors but in St Omer not in Calais, bed spaces are totally insufficient but nobody want to stay there anyway, the food is bad and is not halal and there is nothing to do. The youngest kid in the jungle is just 10, he is with his brother. The youngest unaccompanied minor is 13. He was telling me he has seen a man dying when a group of people went on the motorway to stop the traffic, and a lorry did not stop. All he wants is to go to school and play football and cricket. Why does he have to risk his life for that? 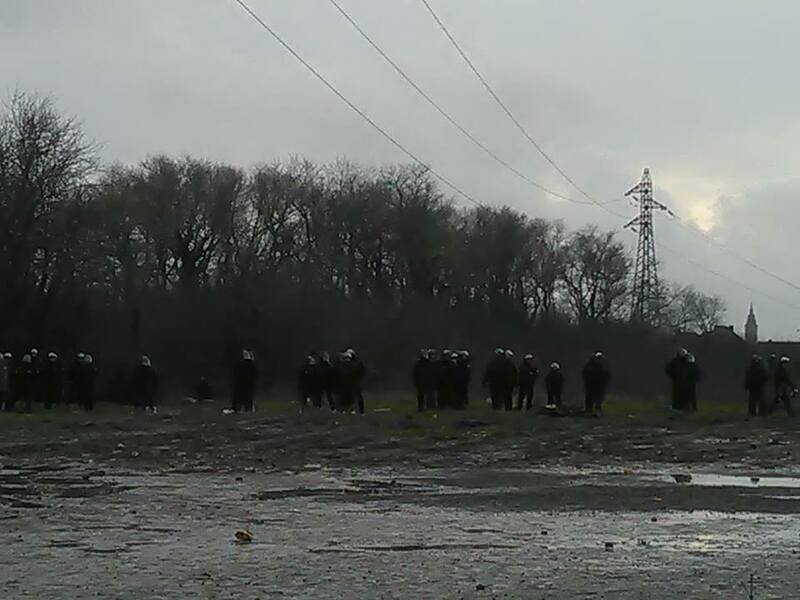 Most people who are in the jungles do not go to the centre of Calais any more because every time they walk they are afraid to be arrested and deported, to first ‘safe countries’ under the Dublin 3 agreements, even if they have been refused there, or even to home countries including countries at war such as Afghanistan and Sudan. The local detention centre is full and people are sent also to other centres, and the deportation machine is working faster and faster. People are hiding their nationality to avoid deportation. Macron wants to double the time people can be detained. He wants to speed up asylum application in France, that results in a rise of refusals of asylum applications, and speed up deportations. Macron does not propose any other solutions, and detention and deportations are not solutions: people keep arriving because they need to save their lives, or come back from first safe countries where they had been deported, and numbers of people sleeping rough or in sub-standard accommodation keep going up. It is a hellish crazy nightmare. 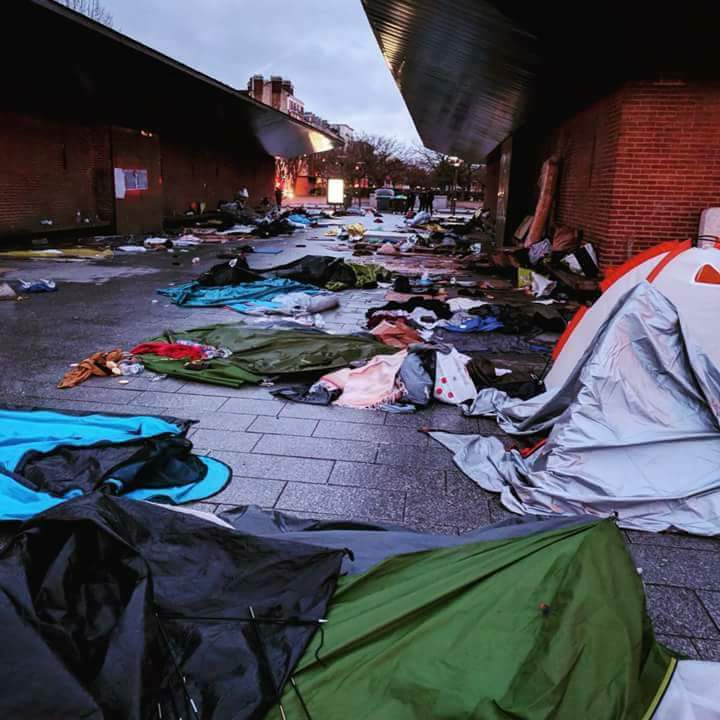 In Paris things are particularly nasty, there are at least 1500 refugees sleeping rough with the police chasing them with gas and truncheons, like in Calais, the only difference is that volunteer groups such as Paris Ground Support usually manage to salvage people’s tents, bedding and belongings and wash them. 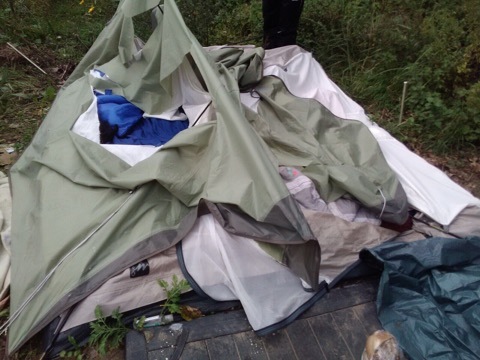 In Calais police slash tents with knives and spray bedding with CS gas, after that it is impossible to wash the stuff and it can only be dumped. VOLUNTEERS IN CALAIS ARE STRUGGLING TO COPE: THERE ARE NEVER ENOUGH MATERIALS AND NEVER ENOUGH VOLUNTEERS, PLEASE HELP. In Dunkirk is even worst. Mobile Refugee Support are doing a great job, and have a good emergency response. Refugee Community Kitchen are preparing 2000 to 2700 meals per day, distributed in Calais twice, in Dunkirk once, and in a couple small camps. If you do the maths is 1000 people, more or less, eating at the distributions in Calais, some eat twice but some do not go to the distributions… well over 1000 people present in Calais then. Macron has announced the State will take over food distributions, and bizarrely RCK welcomed the announcement. I see it as an attempt to get rid of the associations, at least those who sometimes oppose the government, and to get rid of independent witnesses. Who controls the food controls the population, and armed police have been already seen at food distributions. After the UK-France summit and the visit of Macron to Calais, immigration policies reach a new low in inhumanity and irrationality. We must oppose them and defend our brothers and sisters. Questo articolo è stato pubblicato in ACAB, antifa, Border controls, deportations, Immigration detention, Le Toquet treaty, Macron, Migration, police violence, protests, refugee families, refugees, Repression, Sandhurst talks, struggles, Theresa May, unaccompanied minors, Women refugees il 24 gennaio 2018 da EXODUS - watchtheborders. Thanks for this invaluable update; I hope that your own health improves soon too.